15 of the best new hi-fi products at the High End Show 2018 | What Hi-Fi? From £150,000 speakers to £200,000 amplifiers, there was plenty of tempting high-end kit to see at this year's show. If CES is the global, all-encompassing technology playground and the Bristol Sound & Vision Show is the UK’s biggest celebration of hi-fi and home cinema, the Munich High End Show is the annual tour de force for high-end audio. It’s the European stage for hi-fi brands from around the world to show off eight-foot speakers, heavyweight amplifiers and outlandish turntables. First, something a little more real world. Monitor Audio had a packed room at Munich showing off the company's exhaustive range of speakers, including the new entry-level Monitors and Silvers. But under the brightest spotlight was its recently-launched Studio range, a single pair of super-slim speakers (£1000) with matching stands (£350). We’ll be getting our ears around them soon, so watch this space. When a company says it’s about to launch a landmark product in its history, naturally we’re all ears. 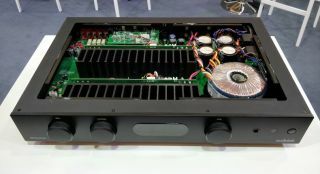 Chord’s Munich launch event saw the unveiling of the Hugo TT 2 preamp/DAC but also the £3900 Chord Étude power amplifier, which sees the first big change to Chord's amplifier design in its 29 years. Étude means ‘study’ in French, and is also the name for an instrumental composition, so we’re hoping for an eloquent as well as musical performer here. Considering each floorstander weighs 45kg, we’re glad we didn't have to help get the new Wilson Benesch Eminence speakers into the show (something we could say about a lot of the kit being exhibited, such as the humongous Ascendo subwoofer). But once in place they sounded excellent and looked, dare we say it, eminent. As a £145,000 pair of flagship speakers should. The fact that the new 159 mono power amplifier is somewhat overshadowed by Burmester’s BC350 Reference speakers in this picture doesn’t seem fair. But make no mistake, this is a 350kg monobloc comprising 4000 components and delivering 1200 watts of power. The $225,000 159 sits above the iconic Burmester 909 that has been going strong since 1990, and is one of three new Signature series products unveiled by the brand. Teased days before the first on-site stein was consumed, Quad’s first pair of headphones certainly looked the part on parent company IAG’s section of the show floor, resplendent in their leather-clad, open-backed, over-ear form - even if they were somewhat dwarfed by the brand’s 8-foot-odd, blue-checked ESL XL electrostatic speakers. The question is, how good do they sound for their £599 price tag? Quad wasn’t the only IAG brand to launch its first pair of headphones. Audiolab revealed the M-EAR in-ears. But we're as intriugued by the forthcoming Audiolab 6000 Series, which comprises a CD transport (£380) and the most affordable integrated amplifier the company has ever created (£600). The new products sit below the existing 8000 Series, introduced in 2015. Both new components were on display as prototypes with unfinished, err, finishes. The monsters of Munich! The Munich Show was a launch pad for the $120,000 Grande Utopia EM Evos (pictured) and the $65,000 Stella Utopia EM Evo, which expand the French brand’s Utopia III Evo speaker line launched last year. They benefit from Focal’s latest speaker technologies and have that familiar bent-over posture, which needless to say mirrored ours after three days walking around the show. The first in Constellation Audio’s Dominion line of ‘smart’ audio products, the Leo all-in-one music system certainly looks as good on paper as it does in the flesh. Equipped with everything from Roon, MQA, Apple AirPlay and Google Chromecast, to a DAC, MM/MC phono stage and other analogue connectivity, it delivers 560 watts of amplification to its two 6.5in woofers, two 2.5in midrange drivers, and two 0.75in tweeters. Should be enough for the Leo to roar like a lion, you'd think. If Carlsberg did amplifier aesthetics… The Relentless is Dan D’Agostino’s new $250,000-per-pair reference mono power amplifier, capable of delivering 6kW into a 2 ohm load. What does that mean? There’s unlikely to be a speaker in existence that it can’t drive comfortably. If you excuse the convoluted name, Astell & Kern’s new portable music players could be another winner for the brand. The top-of-the-range SE100 supports sample rates up to 32-bit/384kHz and DSD256, boasts 128GB of internal storage, and promises ten hours of playback time from a single charge. Coming to a pocket near you this summer, for around £1300 (price TBC). We’ve said it before and we’ll say it again: Audio Research’s REF160M valve monoblock power amp looks like it should come with a spinning glass plate, ‘jacket potato’ mode and timer dial. But the microwave design is at least packing some serious technological heat, such as a new circuit topology with shorter signal paths and fewer, ‘better’, components. Available in July (in black or silver finishes), you'll be able to get a pair for just £28,998. Living up to last year’s launch of the 40th-anniversary-celebrating Special Fortys was always going to be a difficult task, but Dynaudio might just have managed it with an insightful demo of its all-new Confidence 60 floorstanders (£35,000). They're joined in the range by the Confidence 30 and 50 floorstanders and the 20 standmounts. “We removed all limitations during development of Edge – anything goes so long as it’s in pursuit of the best system we’ve ever made. The results speak for themselves,” says Cambridge Audio’s managing director Stuart George. What a way to celebrate a 50th birthday! The highly-anticipated, £4500 Edge A integrated amplifier was sitting pretty in Cambridge’s room at Munich, and after hearing it just before Christmas, we can’t wait to welcome it into our test rooms. Moon showed off just how good an all-Moon system could sound and look. At the centre of its demo was the new Moon 390, a £4750 streaming DAC/preamp comprising network streaming, digital and analogue outputs, a headphone amp and an MM/MC phono stage. Just add amplification and speakers, and you’re away. “The loudspeaker you will never hear"... and not because it’s £45,000 (although perhaps that too), but because it claims to avoid any distortion or colouration, leaving only the music to hear. That’s a claim PMC feels confident it can make after slaving away at these flagship speakers for the past five years.